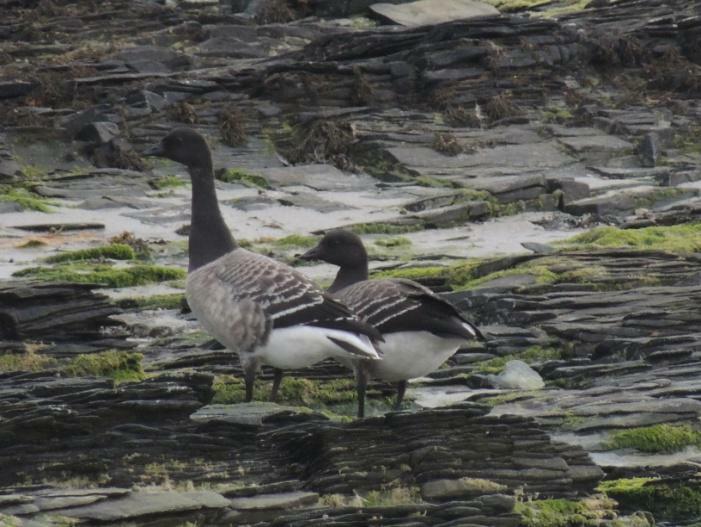 Early October saw the return of the Greenland barnacle geese to Colonsay and Oronsay. The highest count on Oronsay mid-way through the month was an amazing 2396 geese, which in one flock were quite the spectacle, on the ground and in the air. The barnacle geese that winter here breed in Greenland. They make their nests on cliffs and stacks to avoid predators such as Arctic foxes. Life Story BBC1 featured the incredible first steps of newly hatched barnacle geese, making giant leaps from their cliff top nests to the ground, falling over 400ft! Following some gentle encouragement from their parents, the goslings free-fall to the scree slopes below, quite a feat at only a few hours old. It is amazing, after the tremendous trials and tribulations involved in their first steps, that we have thousands of barnacle geese arriving to winter here every year. Wow! The elegant whooper swans have also been passing through. 62 were counted on the strand last week during one of the ‘Connect with Colonsay’ RSPB walks to the island. They looked brilliantly white against the backdrop of a grey and drizzly day. The swans typically travel in their family groups, with the parents guiding their cygnets on the migration route. 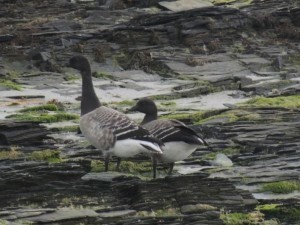 A pair of brent geese were found on Oronsay this month. These long distance migrants will have already travelled thousands of miles on their migration towards their wintering grounds in Ireland. Potentially coming from as far away as Svalbard, the pair pictured were on the island for a week during bad weather – A well deserved break on their epic yearly journey! October is a fantastic time to see an array of bird species making their way South. A short-toed lark put in an appearance (record submitted the rarities committee). 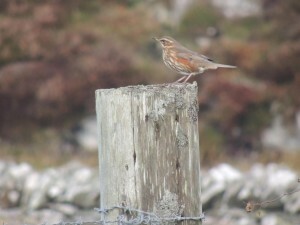 This is a rare bird to see in Argyll and only the third record. Typically, short-toed larks can be found breeding as far away as Mongolia. Two snow buntings were seen on Oronsay, a passage migrant we usually expect to see at this time of year. I enjoyed incredibly close views of bottlenose dolphins last weekend off the west coast of Oronsay. A pod of five dolphins were in close to shore feeding and I was able to watch them for half an hour, working their way round the coast. The grey seal pupping season is now in full swing. 148 pups were counted on Oronsay last week. Autumn and early winter is when grey seals haul out on the beaches around our coast in order to have their pups. Several merlin have also been seen in the past month. These birds will likely be from the Icelandic breeding population which migrate southwards for the winter to make the most of the milder climate. Our native merlin will move off their breeding territories The merlin is a compact falcon which will often be seen dashing past providing only a brief glimpse. Look out for broad based, pointed wings which will appear shorter that those of a typical falcon. It is the smallest bird of prey you will find in the UK. Female merlin are larger than males. They feed on small birds and will often hunt co-operatively in their bonded pairs. Thrushes such as redwing and fieldfare will be leaving their breeding grounds in Iceland and Scandinavia and coming through on mass. They are often seen in large flocks when coming into feed during poor weather. Look out for them feeding, especially in areas where there could be berries and in grassland pastures. We will also have song thrushes and black birds from these breeding grounds. Look out for blackbirds with black bills. It might be a year for waxwings, so keep your eyes peeled for their striking plumage. Look out for wintering Greenland white-fronted geese and barnacle geese. Whooper swans will be passing through on their way to Ireland, Strangford Loch. And look out for waxwings!